For two days this week the world was held hostage by three terrorists weilding assault rifles in Paris, France. The French police are denied the right to carry fire arms, and were sitting ducks for the terrorists, as were the journalists and cartoonists at Charlie Hebdo, a magazine that specializes in publishing satirical articles and cartoons. 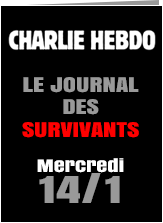 Thirteen people were murdered, including an unarmed French policeman. The terrorist spotted the wounded policeman, and walked up to him and killed him with his rifle. The terrorists, as of this morning, are dead. The French police stormed the terrorists who were hiding in a large printing plant, and they also killed an allied terrorist in a Jewish deli where there were hostages. 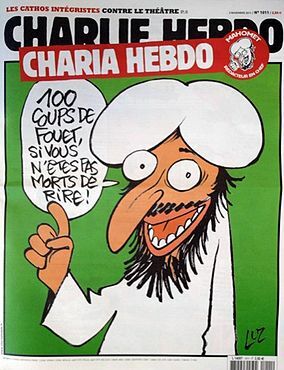 One of favorite targets of Charlie Hebdo is Mohammed, the self proclaimed prophet of Islam. Another target of Charlie Hebdo is Jesus Christ, the embodiment of God for Christians. Christians don’t like the defilement of Jesus, but instead of beheading those who do, Christians pray for those who blaspheme. Muslims treat Mohammed like a god, and in their eyes it is more than a sin to criticize Muhammad. Indeed, our backward Islamic friends consider any slight of Mohammed to be a crime punishable by death. Islam is steeped in ancient tribal traditions, like cutting off the hand of a thief; executing a woman for adultery while the equally guilty man goes free; and its priesthood (Imams) issuing death warrants for perceived slights by anyone who does not agree with their world view. Islam is all about death, and a dead prophet. Islam cannot exist in a world of competing ideas and religions without resorting to violence. Christianity has prospered for over two thousand years in this kind of world, even with physical persecution. There is no negotiating with Muslims, and any words contrary to their belief system are not to be tolerated. To make matters worse, there is an entire class of people in the Western world who excuse the actions of the misguided world of Islam. Included in this portion of our population is our very own President, Barack Obama. If you remember when he started his presidential campaign, many of us noted that Obama had no professional record of any note, and that his childhood was spent in households where the dominant talk and thought were alternately socialistic and Islamic. President Obama may be a very smart man, but he has been deluded by the bankrupt ideas of his parents. Now, we see the hypocrisy of the media in not vetting the lackluster man who would become our President. We can vote out the liberal, politically correct and intellectually dishonest Democrats, but we can do very little about the world wide problem of Islamic terrorism without a leader in our country prepared to meet the challenge. The United States has been fulfilling a leadership role in the protection of democracy and freedom around the world since World War I in the early twentieth century. Backing down from this very important responsibility is exactly the wrong thing to do. President Barack Obama does not get it. Gee, why does mass murder happen in Gun Free Zones? Anyone? obama is not a smart man. No smart man believes in socialism, communism or islam. islam is a cancer upon the Earth. No cancer can be cured by only targeting certain cancer cells. They all must go. With respect, Kid, I agree up to the point about Obama’s intelligence. As I get older, I run into some very intelligent people who just don’t get it. It’s not that they are stupid, but they are victims of group think, their rearing, their parents’ ideas, or their religious values (or lack of). The cancer cell analogy sounds pretty good to me! Not to challenge you sir, and I should have mentioned it in my comment but yes, there are at least 2 kinds of smart. Book smart and life smart. obama may have some book smart, but I was cutting him down on the life smart. fwiw. No problem, my friend. You and your comments are always welcome. There are various reasons why President Obama is totally incapable of mounting the correct response to the Islamic terrorists that would hold us all hostage tot heir perversion of religion. First and foremost, he seems to find it impossible to speak of Islam with anything less than glowing terms. I don’t know if he is a closet Muslim or not, but he obviously holds Islam in high esteem. That puts the brakes on anything he might say or do that could be perceived as a threat to the religion of peace. Thanks for the comment, LD. I vacillate in my opinion of Obama’s reasons, and you are probably right. He may not be a closet Muslim, but he certainly has sympathies in that direction. I would say that his socialistic/communistic sympathies continually over power any other sentiment.